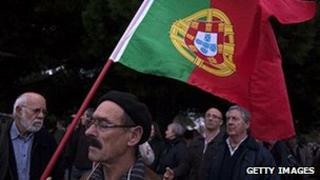 The Portuguese president has said that he will send this year's controversial budget to the Constitutional Court. Aníbal Cavaco Silva said the budget didn't treat citizens fairly, and hit some of them worse than others. The right-of-centre government has argued that the unprecedented tax increases the budget contains were necessary to meet the terms of the country's eurozone bailout. It is only the second time a Portuguese head of state has made such a move. For most Portuguese workers the tax rises that came into effect on January 1 are equivalent to more than a month's wages. President Cavaco Silva made the surprise announcement in his New Year's speech, the day after signing the budget into law. "On my initiative, the Constitutional Court will be called on to decide on the conformity of the 2013 state budget with the constitution of the republic," he said. In his speech he also said the country was in a vicious circle of austerity and recession and acknowledged that Portugal's foreign debt, now twice as high as Portugal's annual output, was unsustainable. The opposition Socialists had already questioned the validity of the tax hikes and had threatened to take them to the Constitutional Court if the president did not. Last year the court ruled against a pay cut for civil servants which forced the government to seek alternative sources of revenue.